v3.2 Interaction Update, Project Armory Patch! Oil Deposits now spawn with an OilBlock that block the spawn of Oil so you need to mine these first before the Oil Spawns. The Oil Refinery now spawns Refined oil at a fixed 20pieces once per day. you can now build an OilPump on OilDeposits that must be manually pumped for Oil with a random yield of a minimum of 25 and maximum of 75 Stack of Oil once a day. Missile Launcher now needs to be charged to 100% Power before it can launch a missile. when turned on it will first charge to 100%. when turned off it will first power down before it can be powered on again. Now has addtional information on the building tab. 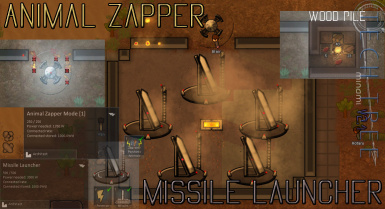 you can now only build 1 missile launcher at a time. MissileLauncher will not fire when artificially roofed. Added on and off button to fishpens. Fishpen, Water Barrel, MoistureBarrel, OilRefinery. Changed ScatteredRocks, Fish, Water marketvalues to 0. Static Disharger has increased minimum yield output when the weather is on Thunderstorms. decreased oil deposit minimum and maximum yield. Changed the Well interaction to only produce Water when Worked on. *right click on the Well and pump for water to receive a full 75 stack of water that is available everytime you interact on it. WaterBarrel now needs to be placed in an unroofed area. it will not accumulate water if it is placed under a roof. Changed buildings that need woodlog requirements to woodplanks. Changed buildings made from stuff to need UtilityMetal instead of Raw Metal. Wind Compressor still offering full power even when under roof. OneWell and 3 MoistureBrella restrictions not restricting when you queue build many of them at once. *added one more condition that removes previously built building when there is more than its restricted number. Replaced Trading Vessels that come every month with a Fixed Trading Contract with a Fee. Initiate a trading contract on the Signal Beacon. The Signal Beacon now has a nice Blinking Red light eyecandy when used. TikiTorch, C-Light - go check em out! Increased Signal Call/Order Vessel price to 800silver. Added a permanent Neurotrainer supply on the Call/Order Vessel. OilLamp now has a new refill mechanic, doesnt need oilTanks anymore, OilLamps are now much more viable as an early light source for the colony. Added Doctoring XP when performing surgery. LogWall: changed texture, added a brown shadow underneath. Added a Signal Beacon failsafe to prevent an interaction lock. Added a prompt at the start of a game to determine how long research will take. 3 choices: Fast, Average, Slow Research Times. Added "Mechanical Component" for building materials in the advanced modifier. Changed Some Advanced Modifier recipes to replace Program Module with Mechanical Component especially on Hydroponics Basin Module. Increased Oil Refinery's Refined oil yield. *Temporary needs balancing. Advanced Modifier now costs 3x the previous price. Fixed Fireplace health, removed fireplace explosion. Fixed drug non-destroyable thing errors. Fixed Missile launcher target destroying the thing in the target location. Fixed Tailoring recipes needing over 80 things, reverted to 75. General Colony mood effect should only start getting colonists after 1 month in game. Fixed some building requirement inconsistensies. Separated main TTM mod from the integrated mods so that you can choose which mods to play with. + Added Thingamajigs on Apparello, can be crafted on the MetalWorks table. + Retained the MachineGunNests attack time. All MachineGunNests Guns cooldown time reduced by a great lot. + Changed MAI construction station requirements to MachineConstruct and Mechanical Engine. -- Took advantage of the Traders Randomized Inventory: May make trader dependency harder or easier depending on your luck. Most used building materials have priority. -- MetalWorks worktable is now used for buildable building components. -- The Advanced Modifier is now used to make Machines and Materials that are only available from traders before. But you need a component that can be found by disassembling mechanoids or a hefty price from traders if you can find one. Made buildings that use stuff, be default built with stuff. Herbs are now only plantable on ground. Mechanoid Guns can now be used. - includes a lot of minor changes that I forgot to list. 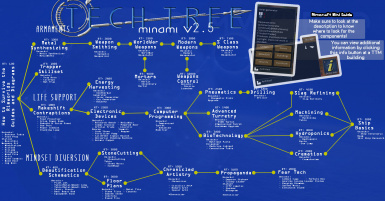 Tech Tree Minami is compatible with mods that adds new stuff and doesn't edit existing items from the core game. The only hiccup is that mods that add new stuff to the game do not get placed in the tech tree. If you want a mod to have a TTM patch you can happily request so! v2.9 Power/Food/AnimHusbandry/New Textures + MAI! The well yields water every few hours. the RainBarrel will accumulate water when it is raining after the rain it will hold max water and you can then eject water. the moisturebrellas holds moisture from the air and from time to time provide little water. --Water is also treated as food but with a very low nutrition just to satiate little hunger or thirst. or you can go get a net and build a "Fishing Net" on deep water on edges of shallow water. after a few hours it will the net will then become a full net which has fish in it, you can then right click on the net with a colonist to make it yield fish. make sure to follow the Arrow on it to know where the fish will drop. - The Cooking pot makes soup! yummy soup. Soup - Water, and any other ingredients. Brothy Soup - Water, and 1 veggies and 1 meat. Excellent Soup - Same as Brothy soup but needs higher cooking skill. Comfortable Matt: A simple and comfier sleeping place than the ground. Grilled Fish: Put fish in the fireplace! all RimWorld animals are now tamable and will breed. New ClassicalArt and ModernArt Texture. Agave can now be cultivated in the hydroponics basin. Reduced grilled food requirements to 6pieces. Changed CompactBattery Requirements to metal. Changed Weapons smelting into one whole general recipe. Cotton plant will now yield Cloth instead of cotton. Corpses not getting buried in a Grave. Added new Mods to TTM! TL;DR lots of changes of lots of stuff added. 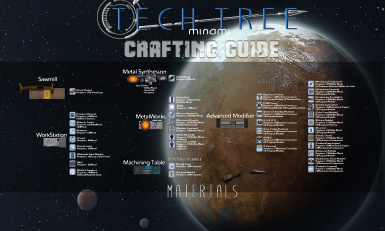 The following mods have been altered to blend in with TechTree Minami. -- Embrasures needs to be researched and are unlocked after Pneumatics Research. -- Changed MachineGun Nests Research to Gunner Nests and Unlocked after WorldWar Weapons Research. -- Added Heavy MachineGun Nest. 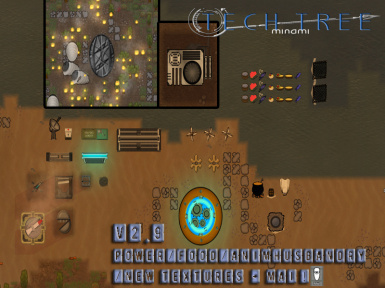 -- Made use of the Tailor's Workstation to enable crafting of RimWorld clothes. -- Added Cloth processing and Leather Preparation to the Tailor's Workstation for Clothing Recipe. -- Changed Light Power Armor recipe requirements. I did not make the RW Power Armor Craftable because I liked hunting for Power Armor. Also I do not want to make Hats Craftable because I want Hats to be collectibles. -- Changed most building requirements to "Fabricants" and "UtilityMetal"
-- All Clutter buildings needs the Beautification Schematics Research to be available. Added new Gun Recipes and Additional Weaponators to accomodate new Guns. Updated Synoptic Weaponizer Recipes to make crafting weapons a viable and not too expensive option! Revised and Updated each weapon *meaning all* recipe descriptions. - Craft Neolithic to American Civil War Era Weapons here. Improvised Turret and T500 Turret are no longer component built they will be bought and built in one go. Improvised Turrets are bought whole from any Trader for 320silver. T500 Turrets are bought as a whole exlusively from an Armament Trader for 1200silver. Slight Increase in Damage, Accuracy, Cooldown and Range. Increase GunPost BurstShots to 2. Cotton - Used for making cloth. Regenulant - heals all wounds and even old wounds but not missing body parts. Stonewalls are now unlocked on Pneumatics Research. Replaced Neolithic Weapons Kit with WeaponsCache. Increased Gun Part and Shells Produce by 1 and Reduced their Utility Metal Requirements to 3 and 8 Respectively. Significantly Reduced HerbPlants growing time. Increased Blast Door UtilityMetal Requirement to 230. Reduced MissileLauncher UtilityMetal Requirement to 180. Made *Closed Blast Doors a high priority target for Raiders. Removed MetalWall Division Requirement for Metal Wall. Increased UtilityMetal Produce from the Metal Synthesizer to 5. Reduced Figurine Recipe Worktime, Increased Produce by 2. Made GasGenerator component built and available after researching ElectronicDevices for 70UtilityMetal. The C.H.E.S.T now requires its own machine which is bought from a General Items Trader. C.H.E.S.T Eject button now drops items directly in front of the building. Changed Universal Vending Machine Texture. MakedoTools and CompactBatteries are now craftable in the WorkStation. CompactBatteries can now be bought from any trader. HandSawmill woodplank making takes 2x more time to make. MetalAlloyDriller and GemInfusedDriller metal yield now drops di.rectly infront of the building. Driller Building can only be built on Rough Stone Terrain. Revised each building requirement description. Closed Blast Doors won't allow shooting over anymore. C.H.E.S.T should now properly dispense its stored item everytime the displayed stackcount is lower than 50 whenever it has extra amounts to dispense. Fixed buildings that don't have reconnect buttons. Fixed Animal Zapper to not affect all Zappers when changing Modes. - will not kill incapacitated raiders anymore. Removed Stimulant, Heal with Medicine and MedKit from the Medicine Table and Concoction Table - they don't work. Removed Red/Green/Yellow Herbs from the environment, instead herbs are now only growable and will not spawn in the wild. Decreased refugees chance to come into colony from Colony Mood Factor from 20% to 15%. You can now capture muffalo's! captured muffalo's breed, you need 1 male and female for them to start. There is a chance of conception so it will not overpopulate captured muffalo's. KidMuffalos are the children of captured muffalo's and matures after 2.5days. Propaganda Buildings e.g(Speaker, CCTVCamera, Hologram) and Fear Tech Buildings now has a new function! - When placed in a prison the buildings have a small chance to convince a prisoner to switch sides and join the colony! - if the Colony's General mood is high, there is a 20% chance of attracting possible refugees to the colony. - have you felt that surviving a raid is a very important event that needs some cherishing? well here it is! after every raid this thought goes into mind of each colonist. C.H.E.S.T (Compression Holder Entity Storage Tank) - Stores 1 type of material at a time, stores a total of 1200stacks. Doesn't store food. T.U.T.O.R.I.A.L (Temporal Unified Tutor On Reformation & Intricate Artificial Learning) - An interactable building that teaches skills to a colonist. MedicalSupplies - Requirements: 5Metal, 2WoodPlanks, 10Agave. Medicine (@Concoction Table) - Requirements: 1 MedicalSupplies (@WorkTable), 1 of each type of Herb. Medicine and Herb Prices lowered. Hopefully fixes that nasty save corrupting bug. Fixed Medicine Cabinet null reference Exception upon load, now loads the saved effect on colonist properly. Changed how starting Items spawn E.G(DropPods, OilDeposit, Starting Supplies). You only need to have "TTM_StartSpawns" in the MapGen for easier editing on compatibility for mods. Once Every month there will be a localTrader coming on the second half of the month. The local trader will trade some items in its respective trader type. Every month there will be a 45% chance of a Tradeship coming. Produces low power erratically varying from time to time. Check its Info Button for more information. Made PlantHerbs sowable in the HydroponicsTable. *Figurines are an income source item. *Figurines can be sold to LocalTraders. Made AI Persona Core buyable from the CallOrder Vessel. Added an Apparel Local Trader. Signal TradeShip: Signals a TradeShip but Raiders may come! Signal Apparel Trader: Calls for a Local Apparel Trader, raiders may also come! Negotiate with Raiders: You can now Negotiate with raiders to stop their attack, they're greedy bastards and wants a lot of silver! Now stores a max of 500energy. now 1x2size and modified texture. CallOrder Vessel now sell items at normal prices. Tradeship Vessels now sell items at cheap prices. Tradeship Silver and Items Amounts Skyrocketed. Modified starting battery packs amount. Changed "CallOrder Signal Beacon" name to "Signal Beacon". Made Signal Beacon building restricted to Unroofed areas only. Removed Custom TTM ShortCircuit Class Restored the original ShortCircuit Class. Lowered NetTrap movement speed slow to half. Crankulant - will not be Tired for 2 days. Stimulant - will HealLife over time. Bloatulant - will not be hungry for 3days. Illusiolant - Gain Happiness for 5 days. *Made at Concoction table, applied at Medicine Cabinet. *All Drugs have MoodKiller AfterEffects. MedKit: Works like a Gun, Force attack to a colonist to Heal. Made at the concoction table. Now Equipped with ProjectArmory v2.11! Transfered buildings that deal with food to the "Food Utilities" Category. Decreased Meals spoil time by 1 day. Made meals made in the Fireplace Unburnable. Transferred Upgrades that can be put into XML. Made a separate class for Special Upgrades so that they will no longer need the UtilityDevice. Nerfed Chronicled Artistry and Fear Tech. Increased ScatteredRocks StackCount to 420. Increased Missile Launcher effect radius by 2x. Now properly interacts with TTM custom Interaction Buildings. Added [Info Button] for TTM custom Interaction Buildings. CallOrder Tradeship now contains new items. New kind of Plants for Concoction table solutions. Added TTM Custom ShortCircuit Condition. Added a Muffalo Shed in the Misc Tab. A Prototype Muffalo Spawner for Muffalo Husbandry for next Version. Spawns Muffalos, same chance as oil deposit yield. Changed how the starting buildings spawns. Changed Fireplace requirement, Now needs a WoodPile instead of an OilTank. Reduced crafting time for shells. CallOrder Vessel now Sells Weapons and Buys your prisoners! Reduced Oil trading price to 8. Added crafting XP to making woodplanks. Quick Fix for weaponators not making weapons. Utility Device still working even though there is no power fix. Fireproof LSS Upgrade "ResearchConsole" Error Fix. Some buildings now need WoodTables and Metal Tables. Im so hungry and im making this changelog. Equipped with Project Armory v2.06! Removed FoodPack, switched to MealSurvivalPack which can be sold to traders. moved Medicine Cabine and Research Console uses here. CALL ORDER VESSEL costs 400silver to Signal. -Calls for an CallOrder Vessel that sells all of the trader items at high prices. All trade item prices are now normalized for passingships. This is required for rubble walls. Can be made at the stonecutting table. 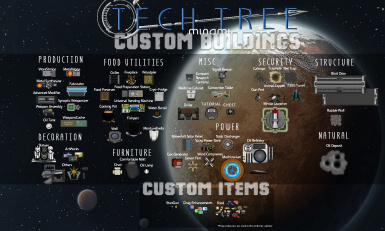 Put the new buildings and researches to their respective techtree branch. Made the new buildings also have their respective item requirements. Oil! although I'm treating it as gas, but it's combustible so legit. get it from an OilDeposit near you! Added Oil as trading material. Added Chronicled Artistry and TTM FearTech Thoughts. Added Custom Thoughts based on events. Put Creating Sunlamp construct to Advanced Modifier only. Tweaked EclipseSubEventA(Feral) Incident to not say "Mechanoids"
Tweaked Annihilation(DestroyerofWorlds) Incident Letter condition checker. Tweaked favorability factor and added incident intervals. Tweaked RageVirus(UnknownCalamity) Incident to make uncontrollable colonists automatically controllable again. Rubble Walls doesn't drop slagdebris anymore. Medicine Cabinet HP heal reduced to 10-35hp per click. Removed corny comments on research. be sure to check the requirements on the description! take notice of CRT resource: when deconstructed gives back CRT to be built somewhere else. Removed stupid storyline. nobody reads it anyway, even I don't read it. Increased GeneralTraders Incident Chance to 20. Removed GunAssembly, Modern Shell Crafting, Uranium Grade Matrix, Review Electronic Circuitry, Advanced Circuitry, A.I Tech. Moved BeautificationSchematics as First research in MindsetDiversion. replaced place with StoneCutting. Increased Research time of most research / Restructured Building Assignments (Check TechTreeMinamiGuide/Image). Workstation, MetalWorks, ScrapPowerBank, Makeshift SolarPanel, Gun Post, Advanced Modifier. Specifically, Foodpack and ToolBox are trading items. Added 3 new traders, and made them sell and trade for UtilityMetal and the other building components, Because you can't make them without a factory you know. Made the 3 existing same with the 3 new traders incase someone is using mods that uses the 3 existing traders. it still can buy the parts through the new traders. Made Medicine Cabinet when I had that eureka moment, the day I was about to upload this version. Revised the alpha research mechanism. Added CRT at start of the game. 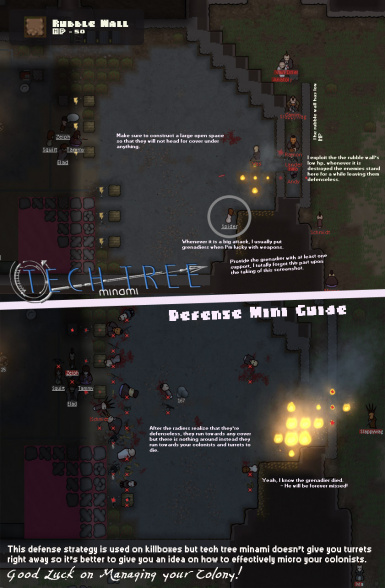 Added Workplaces mod by haplo Revised into Synthesizer/Weaponizer/Weaponator. Added Project Armory Weapons by Evul and PAteam. Project Armory Guns stats unchanged. Synchronized Both mods to interact with each other. Used Uranium, Shells and Missles as ingredients for crafting in Workplaces. Edited all Buildings thingdef (researchPrerequisites) to match TechTree Minami Research Tree. 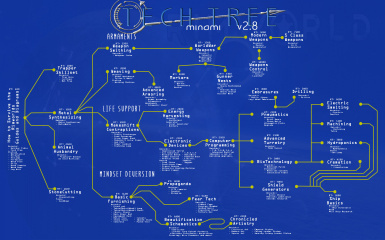 Changed some MemoryThought to match TechTree Minami Research Tree. Made Textures for SynopticWeaponizer, MetalSynthesizer and Weaponator. Made Texture for Neolithic Kit. Added Textures for Chronicled Artistry and its Ingredients. Added Utility Metal and Texture. Made ShredderRounds Projectile to T500Turret. Revised all buildings to need UtilityMetal instead of RawMetal. *8 RawMetals = 3 Utility Metals. Changed Sandbags requirement to StoneBlocks instead of metal.